How To Make Meatloaf (Classic) | Simple. Tasty. Good. Do you know how to make meatloaf then? We all love a good homemade meatloaf, right! From a European point of view this classic one is worthy of a place in the top 5 of typical and most well known American foods. One of the best meatloaves I have ever eaten in America? That was in Brooklyn, New York. The restaurant is called Heights Café and I ordered meatloaf. I can’t remember if it was on the menu or if the meatloaf was a special. Anyway, whenever I hear or read the word meatloaf, that’s what I immediately think of because that one back then was gorgeous. That meatloaf portion was huge because I couldn’t finish it and I normally polish off my plate. Until I sat in front of that lovely plateful. It had 2 gorgeous slices of meatloaf, fluffy mashed potatoes, sautéed green beans and… 3 crunchy fried onion rings. Washed it all down then with a couple of glasses of Brooklyn lager. Epic. I remember that it had been raining quite a bit that day and we were a bit cold. That meal lit up our spirits totally. Anyway, a great food memory! 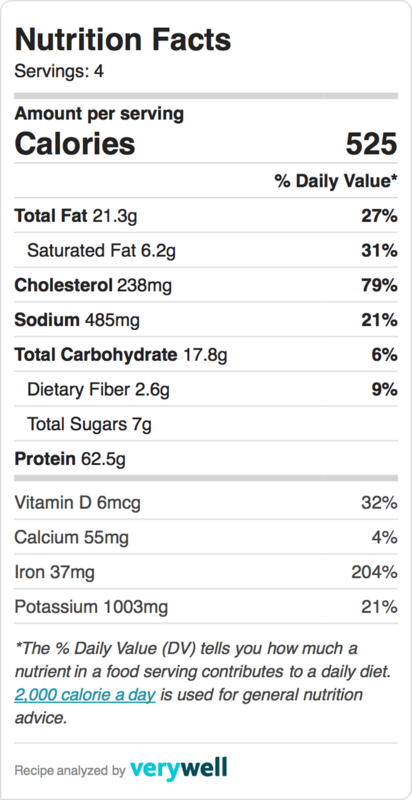 I served my meatloaf below with fries and green beans. And extra tomato ketchup on the side. Did you know that you can easily make your own tomato ketchup at home? 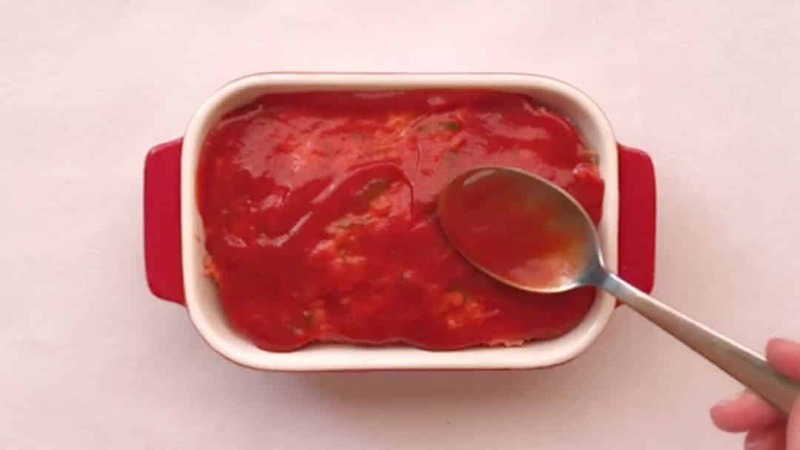 Try out my tomato ketchup recipe! Buy a good quality ground beef – or a mix of beef and pork. Best cuts to make a meatloaf are beef chuck, pork shoulder, veal loin, cuts with a little fat to keep your meatloaf moist and flavorful. Don’t go for lean meat or your meatloaf will be dry. Ask your butcher what cut he recommends and have him grind it for you on the spot. OK so here’s how to make meatloaf divided into 2 recipes: the first one is the manual recipe for if you are going to mix your ground meat and the rest of the ingredients in a large mixing bowl by hand. The second one is prepared using my fabulous KitchenAid Stand Mixer Mini. Watch my video of how to make meatloaf in my fabulous KitchenAid Stand Mixer Mini! Not only the stand mixer is a KitchenAid one, even my bakeware is! The crew down at KitchenAid Europe sent me this 5 piece bakeware set to try out. Thanks a bunch: the bakeware looks just gorgeous on my dinner table. 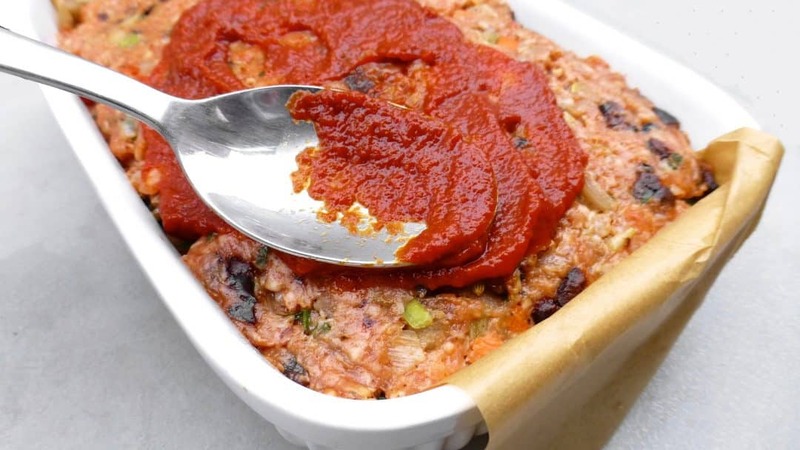 Excellent baking dishes to make this meatloaf in! 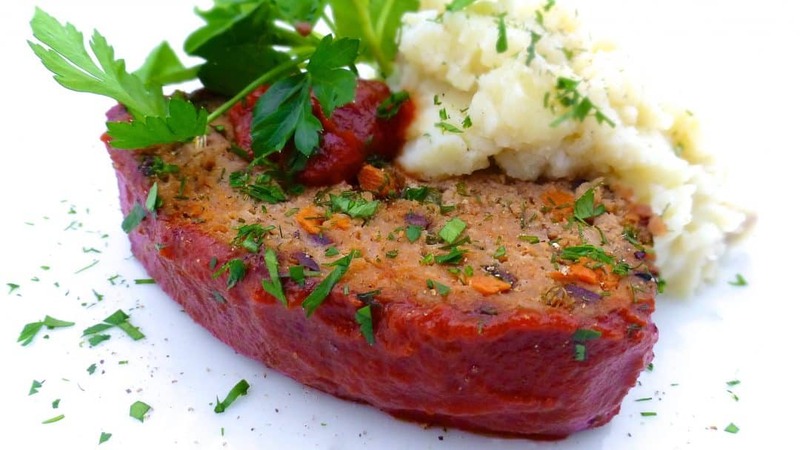 Over to our recipe now, here’s how to make meatloaf! Pour the olive oil in a frying pan and place it over medium heat. Then add the finely diced carrots, garlic, celery and onion. Season with a pinch of pepper and salt. Gently fry the vegetables in the hot oil for 5 minutes until they start to soften a little. Turn off the heat and let the fried vegetables cool down. Then transfer the minced meat to a large mixing bowl and add the freshly chopped parsley, half of the tomato ketchup, a good dash of freshly ground black pepper and salt, a pinch of garlic powder, the dried oregano, the mustard powder, the worcester sauce, the breadcrumbs (or panko) and the eggs. Stir or knead all the ingredients well. Then add the cooled fried vegetables to the meat mince. Stir or knead the mince for another 2 minutes. Pour the spiced meat mince in a baking dish and flatten the top with a spatula or the back of a tablespoon. Then cover the minced meat with the rest of the tomato ketchup. Bake the meatloaf in a preheated oven at 392°F (200°C) for 45 minutes until cooked through. Once it’s done, turn the oven off but let the freshly baked meatloaf rest in the cooling oven for another 15 minutes. Remove the meatloaf from the oven and slice it up. Serve with green beans and mashed potatoes or fries. OK so here’s how to make meatloaf prepared using my fabulous KitchenAid Stand Mixer Mini then. Not only the stand mixer is a KitchenAid one, even my bakeware is! The crew down at KitchenAid Europe sent me this 5 piece bakeware set to try out. Thanks a bunch: the bakeware looks just gorgeous on my dinner table. Excellent baking dishes to make this meatloaf in! Here’s how to make meatloaf. First of all make a fragrant sofrito. Place a pan with the olive oil over medium heat until hot. Then add the finely diced carrots, garlic, celery and onion. Season with a pinch of pepper and salt. Gently fry the vegetables in the hot oil for 5 minutes until they start to soften a little. Then turn off the heat and let the fried vegetables cool down. Transfer the minced meat to the bowl of the KitchenAid Stand Mixer and add the freshly chopped parsley, half of the tomato ketchup, a good dash of freshly ground black pepper and salt, a pinch of garlic powder, the dried oregano, the mustard powder, the worcester sauce, the breadcrumbs (or panko) and the eggs. Attach the flat beater and lower the mixer head. 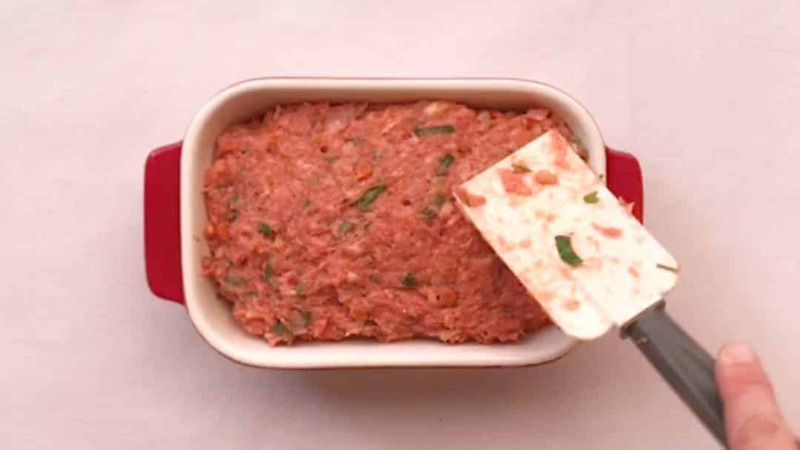 Select speed 3 and knead the minced meat and other ingredients for 2 minutes. Then add the cooled fried vegetables to the meat mince. Knead the mince for another 5 minutes. Pour the spiced meat mince in a baking dish and flatten the top with a spatula or the back of a tablespoon. Then cover the mince meat with the rest of the tomato ketchup. Bake the meatloaf in a preheated oven at 392°F (200°C) for 45 minutes. Once it’s done, turn the oven off but let the freshly baked meatloaf rest in the cooling oven for another 15 minutes. Remove the meatloaf from the oven and slice it up. Serve with green beans and mashed potatoes or fries. 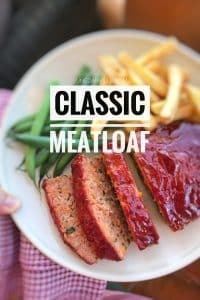 Meatloaf is the perfect recipe if you want to use leftovers because you can throw in just about anything you want. That’s how the black olives got the main role in this second meatloaf recipe below. And I’m very fond of fennel seeds so I added those as well. Subtle yet strong enough to blow you away. A perfect meatloaf the way I prefer it. I served this black olive meatloaf with a bunch of creamy mashed potatoes and a simple green salad because that’s all this meatloaf needs. But the most important side for this meatloaf: pools of homemade ketchup! Here’s how to make meatloaf. Dig in before I do. Nom nom. Place a pan with the butter over medium heat until melted and add the chopped garlic. Gently fry the garlic for 2 minutes. 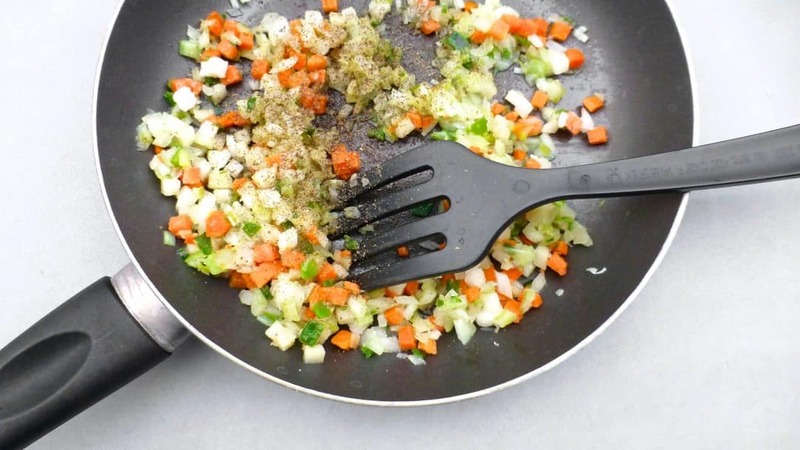 Then add the finely chopped onion, carrot and celery to the pan. Stir and fry the vegetables for 4 to 5 minutes until the onion starts to soften. Season the vegetables with a little pinch of pepper and salt to taste. Then take the pan off the heat and let the vegetables cool down. 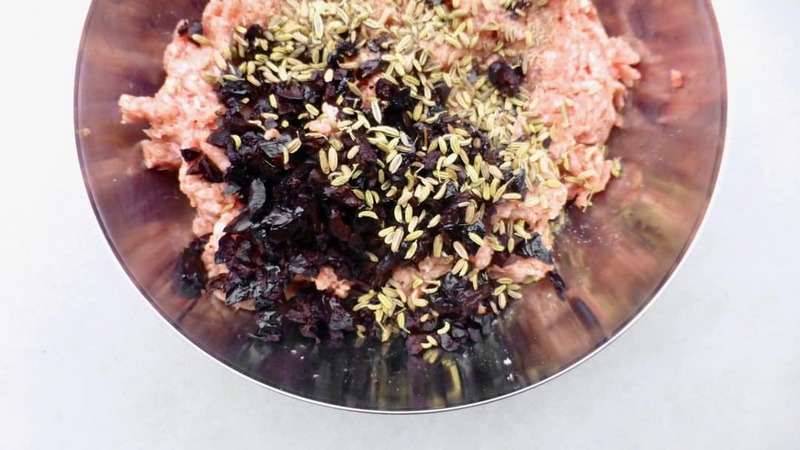 Transfer the minced meat to a large bowl and add the chopped black olives and fennel seeds. Knead until well mixed. Add the cooled vegetables, a pinch of pepper and salt, the freshly chopped parsley, the tomato paste, the worcester sauce and the egg. Knead well. Check the seasoning and add extra pepper or salt to taste if necessary. Then transfer the mince to a baking dish. Cover the top with the tomato ketchup. Bake the meatloaf for 1 hour in a preheated oven at 392°F (200°C) until cooked through. Cover the meatloaf with some tinfoil if the top starts to blacken. Remove the loaf from the oven and let it rest for 5 minutes in its dish. Then slice it up and serve. Well this last minute recipe for meatloaf bites came in pretty handy one day about a year ago because I had a handful of minced meat left. I had made my beef ravioli for dinner the day before and again I didn’t have the heart to get rid of it right away. So I went through my pantry and fridge until I was able to dig up some quick friends for it: pecan nuts and a bunch of other leftovers as well: an egg white, a bit of leftover homemade tomato ketchup and a dash of ground cinnamon to brighten the flavors up some more. I combined the whole lot and stuffed them in a small baking dish. My first thought was to just bake some meatloaf to serve as a cold stuffing for my lunch sandwich the next day but it didn’t get that far. I diced the meatloaf up and served it with some strong mustard as an appetizer. Surprisingly tasty last minute bite!! 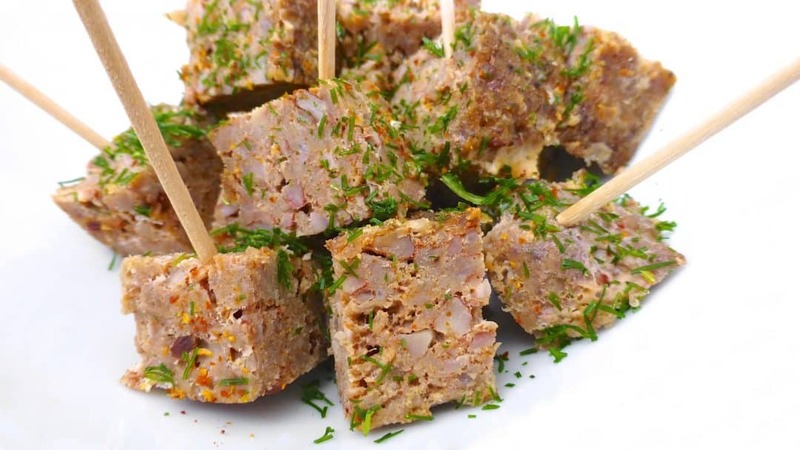 Meatloaf Bites with pecan nuts and cinnamon, excellent with some mustard as a dipping sauce! 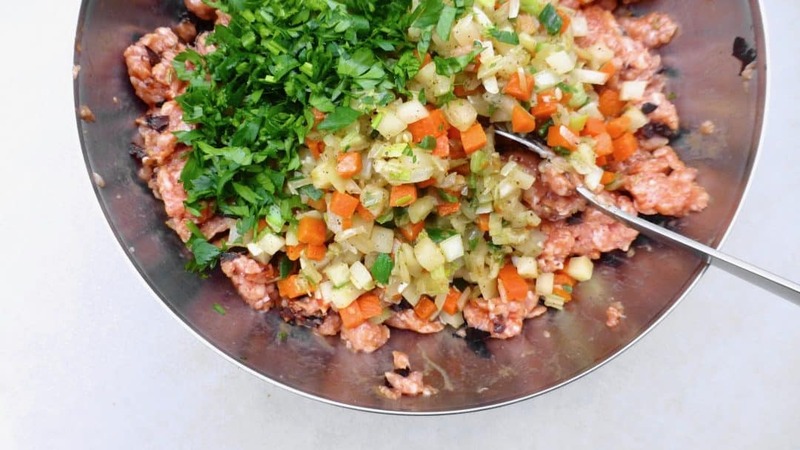 Transfer the minced meat to a large mixing bowl and add the finely chopped shallot and garlic. Sprinkle with the crushed pecan nuts and then add the tomato ketchup, the olive oil and the egg white. Stir all the ingredients well until you get a moist mince mixture. Season it with a good dash of pepper and salt. Sprinkle with the ground cinnamon. Stir or knead the mince well again. Taste a little pinch of it and add extra pepper or salt to taste if necessary. Lightly oil a small ceramic baking dish because otherwise the meat will stick to it while baking. Then add the mince. Tuck it in nicely. Bake the pecan meatloaf in a preheated oven at 356°F (180°C). Then remove the loaf and let it cool down fully at room temperature. Carefully take the loaf out of the dish and cut it up into bite-size squares. Transfer them to a bowl or a serving plate and serve with strong mustard as a dipping sauce.